Technology is being utilized in the classroom in several ways for second grade at Combs Traditional Academy. 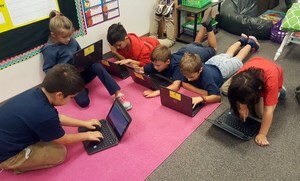 Chromebooks allow students to learn at their own pace. Students get excited about learning when using programs such as Accelerated Reader, Moby Max, BrainPop and Kahoot programs that help to extend and differentiate learning to meet students’ needs. Additionally, the use of technology helps to prepare students with skills, such as keyboarding, coding, and collaboration. CTA is extremely grateful for the voter-approved bond that provided the new displays, document cameras, student computers, and teacher laptops.